This July at the San Diego Comic-Con, live the Zombie Apocalypse of Robert Kirkman's The Walking Dead. Need more reasons to attend this year's San Diego Comic-Con (SDCC)? 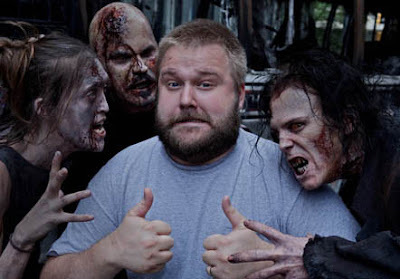 How about the actual experience in living the live the Zombie Apocalypse of Robert Kirkman's The Walking Dead? 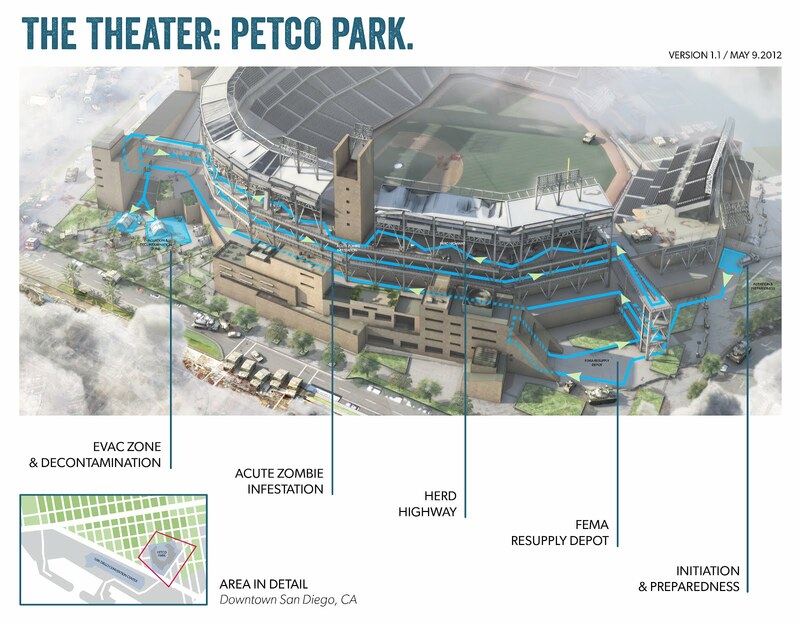 Held to commemorate the 100th issue of The Walking Dead comic book series, creator Robert Kirkman has earlier announced "The Walking Dead Escape", a zombie apocalypse obstacle course that will reportedly "transformed San Diego’s PetCo Park into the early days of society’s collapse" and "San Diego is just the first city to fall." What makes this event more intriguing would be the fact that this ain't no run-of-the-mill outrun-the-zombie race. The Walking Dead Escape will be set up as an interactive experience for fans of both the wildly popular TV series and critically acclaimed comic book series with tons of references throughout the route. As what Kirkman commented, "We wanted fans to experience — as closely as possible — the end of the world. It’s going to be a fun, messy time. “You can run, jog, walk. I’m probably going to crawl." Fans can participate by buying a ticket to walk, jog, or run through the path filled with treacherous twists and turns, or watch the event from a distance if you have a severe case of phobia for hordes of undeads. Fans can even participate as proud members of the undead themselves. 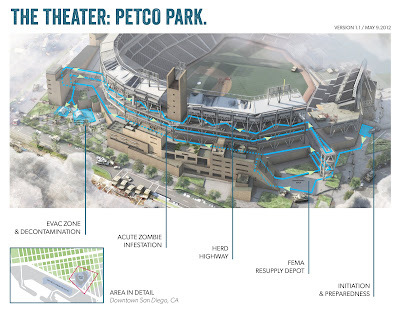 The event will be at San Diego’s PetCo Park from July 12th through the 14th. Check out the official website for more information of ticketing details. In the meantime, hit the jump to check out course map followed excerpts from the fun-filled FAQ from the website. Survivor: Navigate through Zombie infected Evacuation Zone. Walker: Embrace the inevitable and become one of the undead. Spectator: Watch the Apocalypse from the sidelines at the Escape Party. No one will be disqualified if they cannot complete an obstacle. The course has been specifically designed for participants with a wide range of abilities. Each obstacle is created to include an “easier route” for participants with limited physical abilities. On the day of the event, Survivors, Walkers and Spectators are expected to provide photo ID only. There are no hard tickets or confirmation printouts necessary. Spectator children under 16 who have purchased a ticket and do not have a photo ID will need to be accompanied by an adult. The goal of the Survivor is to make it to the Evacuation Zone without any contact with Walkers. We ask that you do not “fight back” should you come in contact with a Walker. There is no point - you’re doomed anyways. Government Scientists will be waiting at the Evacuation Zone and will perform a highly confidential scan to determine whether or not participants have been infected by the virus. If you come in contact with a Walker during the course, you will still be able to complete the course in it’s entirety. You must start with your registered Evacuation wave time in order to participate. No handheld devices (cameras, video cameras, water bottles, etc.) are allowed on the course. There will be a secure gear check for you to store your belongings prior to the start of your wave. Survivors must be 16 years of age on the date of the event to participate - no exceptions. Any Survivor who does not comply with the aforementioned rules will be banned from participation. The goal of the Walker is to haunt your assigned grounds as brutally and as brainlessly as possible. Walkers must arrive 2 hours prior to their registered wave time for makeup and training. No exceptions. Walkers will receive further instruction on what to wear, etc. via email correspondence from The Walking Dead Escape officials. This information is proprietary to Walkers prior to the event as to surprise and scare survivors as much as possible. All Walkers will receive “Walker Training” prior to their shift. You must start with your registered shift in order to participate. Walkers must be 16 years of age on the date of the event to participate - no exceptions. Walkers will be able to keep their makeup on after finishing their shift. Any Walker who does not comply with the aforementioned rules will be banned from participation. There is no age limit for spectators. Children under the age of 16 who have purchased a ticket and do not have a form of photo ID are required to have an adult present at check in. All spectator tickets are good for 2 hours viewing time. Spectators are free to come and go from the viewing party at any time during their allotted 2 hours. All purchases are final with no refunds. There will be food and drink available for purchase in the Spectator lounge.